The different colors found within members of the of the corundum group are due to trace amounts of elements that act as colorants. Corundum without impurities, and therefore with out color, are rare and are called white sapphire. 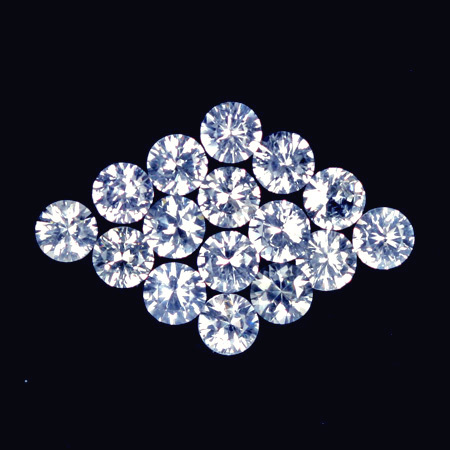 White sapphire is a hard and durable gemstone suitable for all forms of jewelry. With its high luster and brilliance white sapphire is a good substitute for diamond. Some white sapphire contains fine silk needles that appear milky white when cut in cabochon produce a six ray star. The primary source for white sapphire is Sri Lanka and Burma although they are found else where in small quantities. Sapphire is the designated birthstone for September. Beautiful white colorless gems. Dazzling brilliance excellent substitute for diamond. 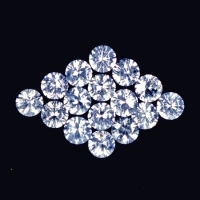 Precision cut diamond round. Eye clean clarity. There are 13 of these fine gems available. Price listed is per gemstone. Receive a 20% discount on the purchase of 2 or more of these gems.